The National Weather Service says five tornadoes have ripped through the Texas Panhandle, downing power lines and damaging a Halliburton plant that was closed at the time. National Weather Service forecaster Mike Gittinger in Amarillo said Monday night the full extent of the damage “remains sketchy.” But he says none of the storms struck heavily populated areas. There were no immediate reports of injuries. Gittinger says the five tornadoes included three reports of wedge tornadoes, including two near Pampa nearly a mile wide. 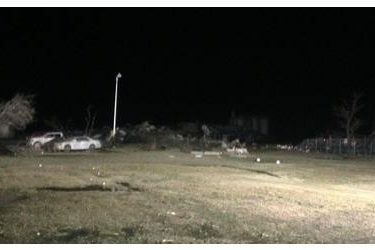 The Gray County Sheriff’s Office said at least one house and several businesses sustained damage east of Pampa. A chemical leak was discovered at the Halliburton plant in Pampa. Crews deemed the complex safe to search and were evaluating it late Monday.